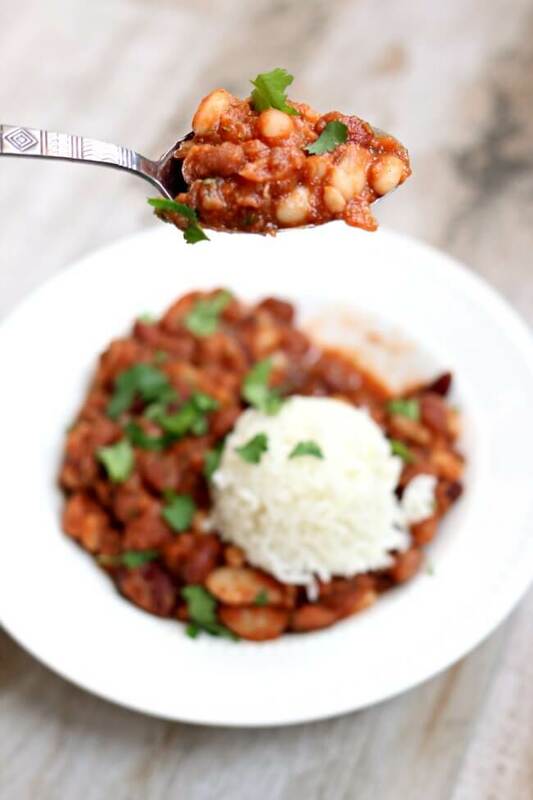 Cajun Beans and Rice–a meatless, saucy, cajun seasoned dish that uses dried beans in the slow cooker or on the stovetop. A perfect dish for Mardi Gras. Tomorrow is Mardi Gras and I’m thinking that you should make these Cajun seasoned beans and rice for dinner to celebrate! These almost creamy cajun beans and rice contain just a handful of ingredients but the flavor packs a punch. You start with a package of Hurst’s Cajun 15 Bean Soup. You can find these at the grocery store next to other packages of dried beans. 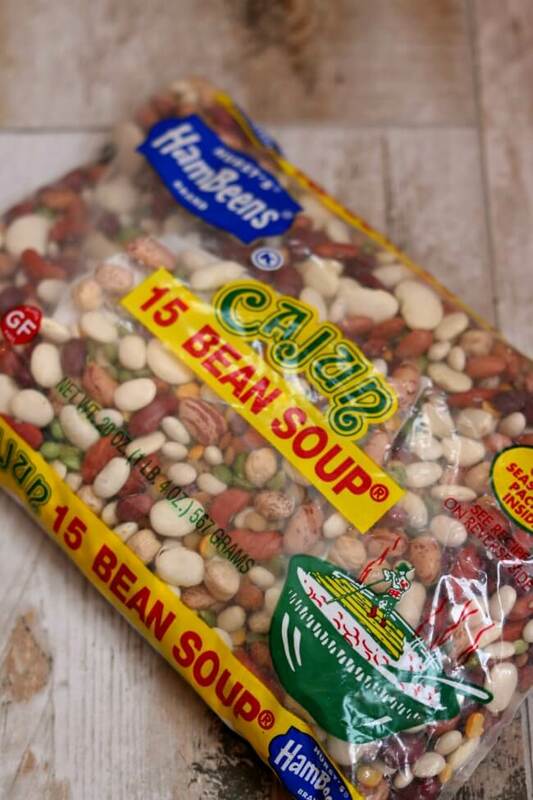 Hurst’s Cajun 15 Bean Soup contains 15 varieties of dried beans–namely northern, pinto, lima, yelloweye, garbanzos, green split peas, kidney, cranberry bean, white, pink, small red, yellow split pea, lentil, navy, white kidney and black beans. I love making dried beans in my slow cooker but for this recipe I actually ended up cooking it on the stove. You can use either cooking method that you prefer. Basically you’ll cook the beans until they’re soft, add some tomato sauce, the magical seasoning packet and a couple of other ingredients. You’ll end up with a healthy, meatless meal that tastes amazing served over rice. It’s not too spicy so don’t worry if you’re not a fan of spice. And if you are a fan of spice you can always add some more kick with some hot sauce! For these Cajun beans and rice I used my 6 quart oval Kitchenaid slow cooker. I love this slow cooker (you can see me talking about it in a video here). It cooks low and evenly. I love the medium heat choice because most slow cookers that I’ve seen only have the option of cooking on low or high. If you’re going to buy just one slow cooker, this is the one that I recommend. 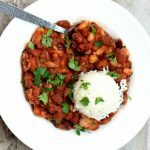 A meatless, saucy, cajun seasoned dish that uses dried beans in the slow cooker or on the stovetop. A perfect dish for Mardi Gras. For cooking on the stovetop: Open package of beans and reserve seasoning packet for later. Rinse the beans. Place rinsed beans with 10 cups of water in a large pot on the stove over medium high heat. Bring to a boil. Reduce the heat to low, cover the pot and let simmer for about 90 minutes, or until beans are soft and tender. Stir every once in a while. For cooking in a slow cooker: reserve seasoning packet for later, allow the beans to soak overnight, or 8 hours. After soaking, drain the water. 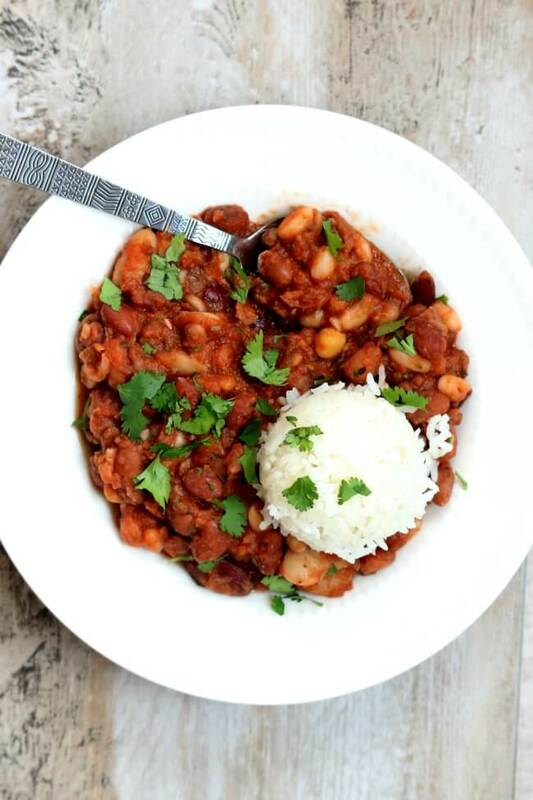 Place beans in large slow cooker with 10 cups of water. Cook on low for 8-10 hours, or until tender. Drain the beans of excess water. Place beans back in pot or in slow cooker. Add in tomato sauce, garlic powder, onion powder and dried parsley. Add in the seasoning packet. Stir. Add in salt to taste. 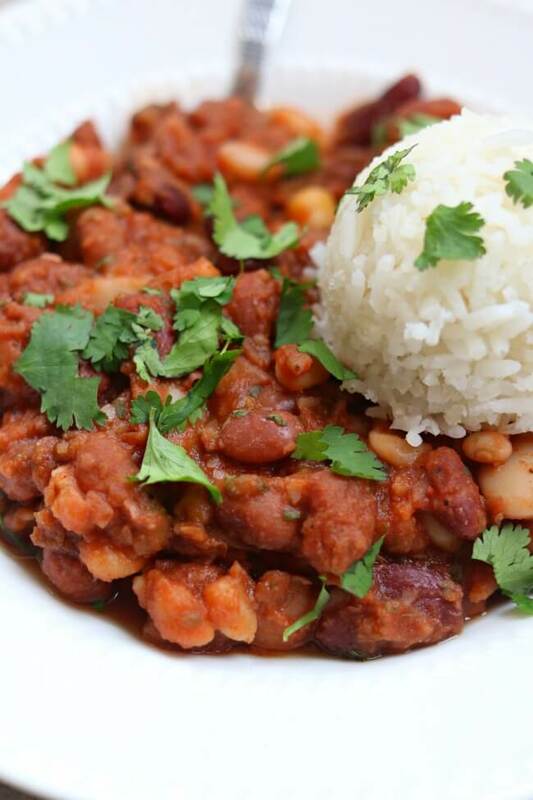 Serve beans with a scoop of rice and cilantro. I haven’t tried this one in the IP yet. But this is how I would do it: Reserve seasoning packet for later, allow the beans to soak overnight, or 8 hours. After soaking, drain the water. Place beans in IP with 10 cups of water. Cover and make sure valve is on sealing. Manual button for 20 minutes. NPR for 10 minutes. Drain the beans of excess water. Place beans back in pot. Turn to saute mode. Add in tomato sauce, garlic powder, onion powder and dried parsley. Add in the seasoning packet. Stir. Add in salt to taste. Beans and rice are my favorite. I can eat them anytime because these are easy too cook. Your recipe and its ready images are looking awesome. If you have YouTube channel then please share me because i want to use your recipe with your instruction. I love beans and rice too! I do have a youtube channel but I don’t have a video for this particular recipe.